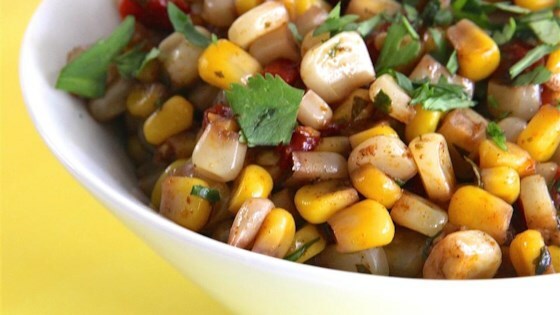 "This sweet-and-sour corn salad makes a great accompaniment for any Tex-Mex meal." Combine corn, red wine vinegar, red peppers, cilantro, sugar, olive oil, cumin, red pepper flakes, chili powder, and ginger together in a saucepan; bring to a boil, stirring frequently to dissolve the sugar. Reduce heat to medium-low and cook until the liquid evaporates, about 25 minutes. For an even better flavor, get whole cobs of sweet maize from your local farmer's market. Cut corn from the cob and oven-roast with a bit of unsalted butter. Maize is ready to be used in this recipe once kernels are slightly browned and fragrant.